Summer showers are not only bringing flowers this season but also a flurry of ants to the Southeastern region of the United States. As Florida residents are baffled by the dramatic spikes in infestation, experts say the rain may be to blame. “What’s happening is after it rains, they’re going to send out swarmers, kings and queens – starting a new colony,” said Craig Carlson, of All “U” Need Pest Control. Frequent and heavy rain is forcing these creepy crawlers to search for higher ground, making your home a prime target. 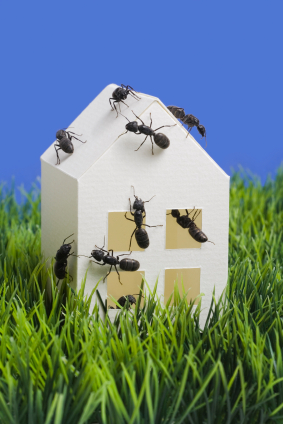 Several types of ants have been reported invading homes and yards across the state, including Pyramid Ants and Florida Ants which can be classified into three groups: house infesting, yard infesting, and carpenter ants. In search of dry shelter, food and water, these tiny creatures can be spotted emerging from cracks and crannies, swarming indoors and contaminating food. These few ants aren’t operating alone; armies of hundreds or possibly thousands of unseen ants may be marching in and around your home. They create an undesirable situation by colonizing in structures, causing costly and dangerous damage to homes and property. Seal cracks and crevices to avoid entry. Treat pest problems with the appropriate pesticide or herbicide product to effectively remove the problem. Have a professional pest control operator check your home every three months. At the onset of an invasion, act immediately to control and eliminate pests. Learning how to keep your home pest-free is important to maintaining a healthy home. Learn more about other steps you can take to ensure a pest-free home by visiting Debug the Myths.